The day of Hammers departure to get back on the trail has arrived. It feels so strange to be parting after spending so much time together on the trail. Although a lot of the time we were hiking the PCT we were together and yet alone. It sounds odd but we would hike alone for long stretches of time absorbed in our own thoughts and musings. So it may not be so strange for him to hike alone. Hammer had just a small task to do before he was set footloose on the PCT and that was to deliver me to Sisters where I will be until I can get off the crutches and start weighbearing in just the moon-boot. 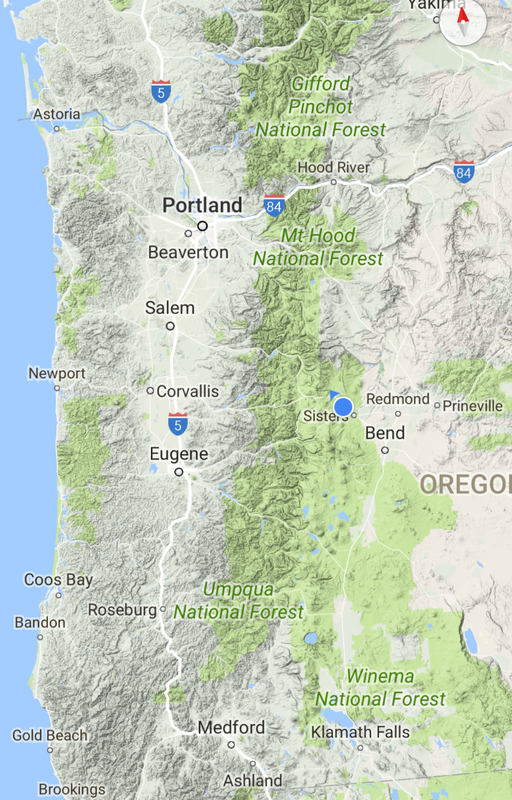 I will also be able to meet up with Hammer as he comes through this area on his way through Oregon. I am staying a bit out of Sisters at Black Butte Ranch as a guest of Dana and Stephen. We met Dana and Stephen a few days after starting out on the PCT. Dana is section hiking the last stretch of the Oregon section of the PCT. Very generously Dana and Stephen have given me a beautiful space, a place where I can I can continue to rehabilitate the ankle injury and also to reflect on the past 3 months on the PCT. I am deeply humbled by such generosity. 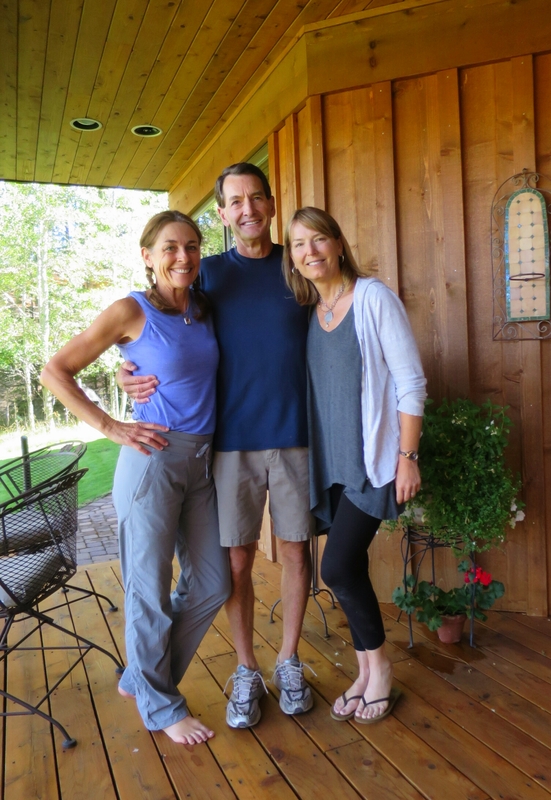 Dana, Stephen and their friend Anne who hiked a section of the PCT in Oregon. After leaving me at Sisters, Hammer made it back to Ashland before dark and will be back on trail tomorrow morning. Have you heard that a new fire has developed near Crater Lake. The Pacific Crest Trail Association website gives the details of detour route around the fire. Pleas refer to their website for specific details. Thank you for letting us know Dave. I’ve followed your entire journey, and am so sorry to hear you won’t be able to continue. So disappointing after making it so far, but your approach is positive and pragmatic; indeed you must feel privileged to have experienced the whole of California! Best wishes for your recovery, and to Hammer, who will have to adjust to hiking without you. Thank you staying with us and for your good wishes Kat. It has been so nice knowing there is a whole community off-trail who are with you in spirit. Happy to have you along Liz. I hope your daughter is enjoying her hike. Nice. 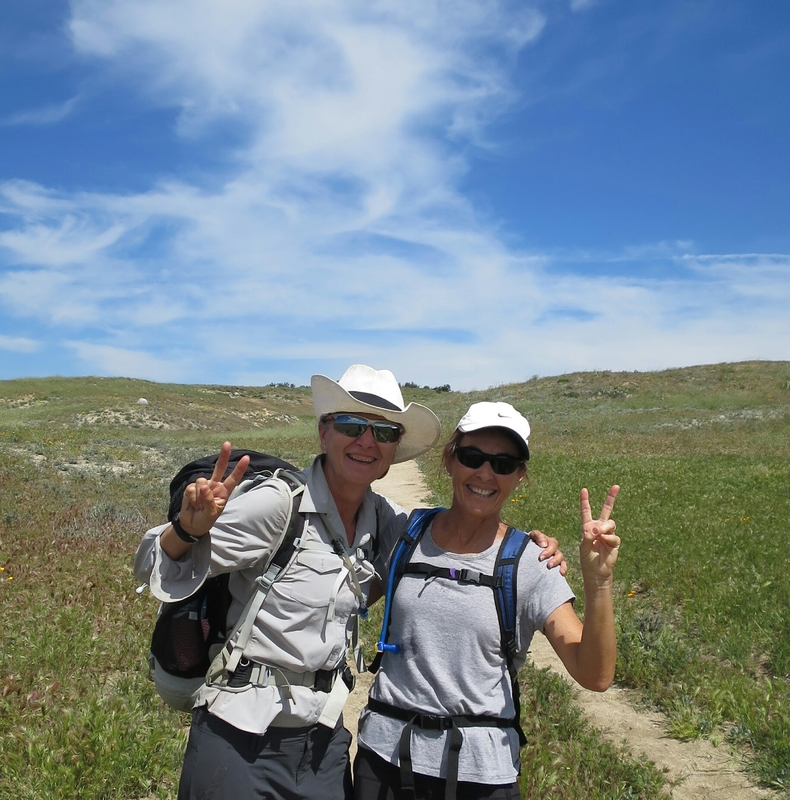 We have not met too many Aussie on the trail although we have heard that there are quite a few. Just reared your post and realised that we may have met your daughter at Warner Springs, way back in the desert. Are you from Kyogle? Lovely to hear that Gwen is still on trail. We often wondered how she was going. It is a lovely area you are living in Liz. We may visit one day. While a University student, Hammer was a flatmate to a couple of your neighbours I believe, Andre and Jane.